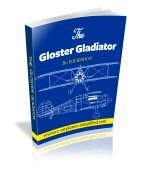 The Hangar 9 Piper Cub Giant Scale RC. 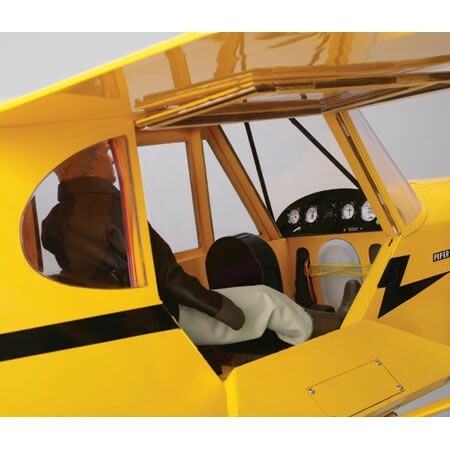 The Hangar 9 Piper Cub scale plane is an accurate quarter scale ARF RC airplane. 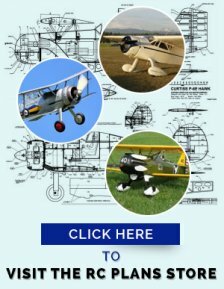 There must be more scale RC airplanes of the Piper Cub than any other and it's great flying characteristics and easy to replicate scale details are the two main reasons why this is so. "Nothing flies like a Cub" is a well known aviation saying and it really is true! 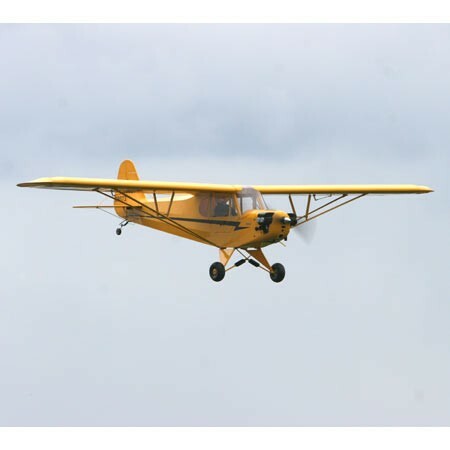 A well built and aligned J3 Cub flies in a very forgiving style, yet can perform scale like aerobatics, such as barrel rolls, wing-overs and big loops. 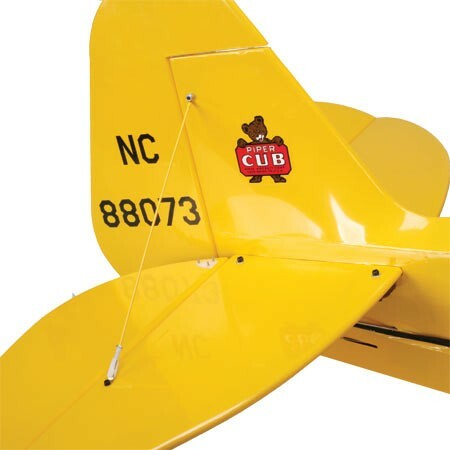 The Hangar 9 Piper Cub is constructed of laser-cut balsa and ply and is expertly covered in Cub yellow UltaCote. This giant scale plane has a wing span of 106" and the finished weight will be between 14.5 and 16,5lb. She can be powered by a 1.00-1.6 2 stroke, a 1.2-1.84 stroke, a 20-26cc RC gas engine or a 110 size outrunner brushless motor. If you find the Hangar 9 Piper Cub on the big side for your taste, then maybe the E-Flite Super Cub will be more your size. If a completely ready to fly smaller model is what you are looking for. then consider the Parkzone J-3 Cub. Access to the interior of the Hangar 9 Piper Cub is provided by the scale split door and the pilot you can see is included in the kit. This is a very good move by Hangar 9- you can spend a lot of time looking for the right pilot and this one is pose able. 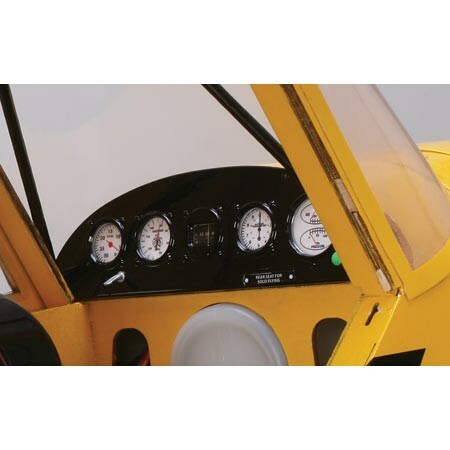 The scale cockpit panel is an example of the attention to detail that is shown on the Hangar 9 Piper Cub. There is even the Cub emblem on the tachometer! Unfortunately, the end of the tank is visible. It could be painted cub yellow or covered over with a panel. Here we can see the scale like covering at the vertical fin/fuselage juncture. The complete tail assembly is bolted on. This makes it very convenient for replacement purposes, but please check frequently that the bolts have not come loose and apply thread locker during the assembly process. The rudder is actuated by a cable pull/pull system and the elevators require a separate servo (mounted beneath the cockpit floor) for each half. This set-up requires either a JR Matchbox or transmitter mixing or you could use one reverse servo and a y-harness. 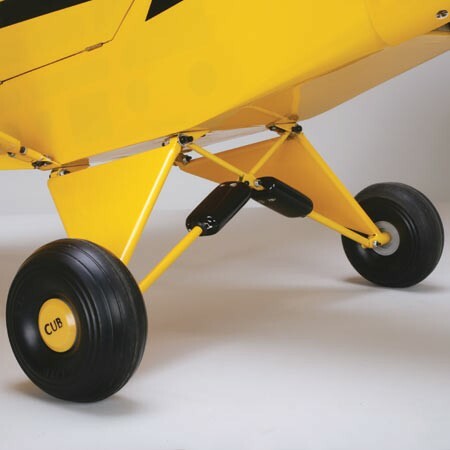 The landing gear on this Hangar 9 Piper Cub is an accurate reproduction of the full scale, with nice looking Piper Cub wheels and shock absorbing struts. The wing struts also attach at this point. All of the hardware is of first class quality and of American standard sizes-no metric stuff here! 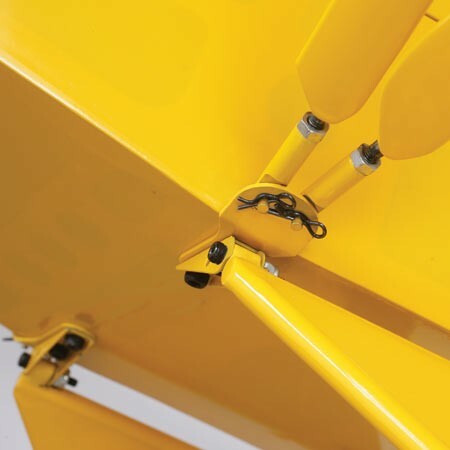 This photo shows how the struts attach to the fuselage with quick release cotter pins. This system is certainly quick to hook-up and disassemble, however it is easy to loose those little cotter pins in the grass! This feature makes transportation and storage a little simpler and I wish my J3 Cub had this idea! My Cub is many years old and was built by a competitor but it is still flying and has given me excellent service, As mentioned earlier-"Nothing flies like a Cub"
The range of power options is impressive. 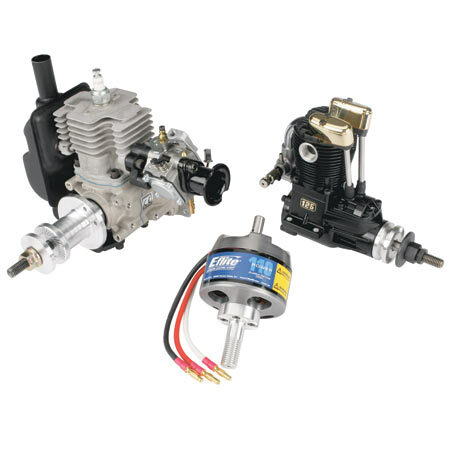 The RC gas engine shown is a Zenoah 20cc Electronic Ignition Gas Engine and the glow engine is a Saito FA-125A Golden Knight: AH. The outrunner brushless motor is an E-Flite Power 110 Brushless Outrunner Motor, 295Kv. All these options are shown in the manual and on the drilling template for the firewall. To finish off the electrical installation, you will also need a 85Amp brushless RC Esc and a pair of 4000-5000mAh 4S 14.8V lithium polymer batteries. 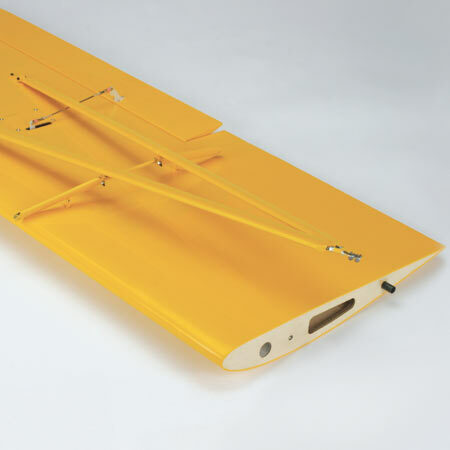 To complete the Hangar 9 Piper Cub you will need a minimum of a 4-channel radio system and 6 servos. Recommended servo is the JR DS821 High Torque Servo. This unit has a torque of 88oz/in and a speed of 0.15 seconds at a voltage of 6.0V. Easy going flying characteristics. Very forgiving and a lot of fun to fly. Very complete kit, with lots of scale details. Usual high standard Hangar 9 construction and design. A nice feature is that the radio gear is concealed under the cockpit floor, so a good scale interior is available. Although the covering is beautifully applied UltraCote, it is still a glossy, film covering and not scale! It is hard to find fault with this 1/4 scale RC plane that flies like a beginner RC plane! After reading a lot of reviews, it was very difficult to find any complaints at all! The only negative comment was regarding push rod rattle, at low engine speed! 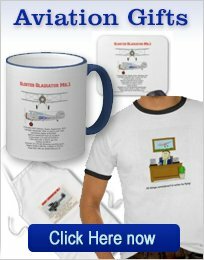 As we stated at the beginning of this page-"Nothing flies like a Cub" and this Piper Cub should last a long time and be your favorite for years. This is an excellent ARF airplane that is easily up to the standards set by Hangar 9. However, Hangar 9 also have the I/4 scale Super Cub. More detail and a wider cowl may interest you!